The latest sweeper from Victory Sweepers is designed for effective sweeping of roads, runways and construction sites. 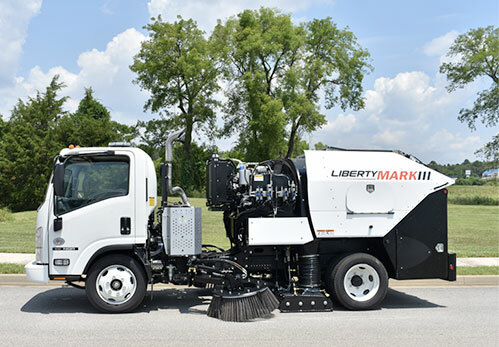 The management team at Victory Sweepers, a division of ROOTS Multi Clean Inc., is pleased to announce the company's new truck-mounted sweeper model, the Liberty MARK III. This new Victory Sweepers' model offers a regenerative air design. Standard equipment includes a blast orifice sweeping head, 12-inch intake tube (intake suction located on the right side) and a 4.35 cubic yard, all stainless, high-dumping hopper. The MARK III is currently available mounted on Isuzu 14,500, 16,000, 17,950 and 19,900 GVW chassis, depending upon customer preferences and payload requirements. The new MARK III is powered by a 60 HP Perkins auxiliary engine and a 30-inch high pressure, backward-incline fan. This fan configuration allows the blast orifice to perform extremely well. The sweeper is outfitted with extra large toolboxes made from non-corrosive aluminum. The Mark III also offers simple hydraulic inspection and combination hopper cleanout doors for ease of cleaning. The Mark III's standard "Hood's Up"SM feature allows the front portion of the sweeping head to be raised or lowered on the fly, which will solve most bulldozing issues in heavy debris. A dust suppression water capacity of 105 US gallons rounds out the Mark III's basic standard features. According to Mark Schwarze, Victory's National Sales Manager, "The Mark III sweepers are currently in stock with additional production being added weekly. Call the Victory Team for a demonstration today." Reach Victory toll-free, at 844-4-SWEEPER (844-479-3373). You may also send email to info@ victorysweepers.com. The web page for the Mark III model, where specifications' information may also be downloaded, is located here.